Weather Report wise, it's still raining. Blech. But that's ok because I had an ADVENTURE yesterday. Uhm, Mom, we need to make that text bigger. ADVENTURE. Ooo, much nicer, and in purple too. Nice touch Mom. So here's how my Adventure started. Daddy came home from work and checked the mailbox while I had a pee. I'd check the mailbox put it's on the wrong side of the door and I don't have opposible thumbs. There was a letter from Canada Post, FOR ME! I had a box! A Box! A BOX! Could it be my delicious cookies from Miss Lea at Poochini's Barkery? So when Mom came home from work we all hopped into the car and we went to go and get the BOX. I had to stay in the car (did I mention the rain?) but I was hoping to have to go inside to sign something. No luck for the Pei. Sad face. Mom and Dad came out with MY BOX! I made sure to sniff it all over. Yup, it smelled right! Dad couldn't drive home fast enough for me. Miss Lea is so creative, and I think she likes me. Look at that label! And the paw prints all over the box! Thank you Miss Lea! Dad helped me open the box, saving the sticker too, what a guy! Inside was a note saying to open the cookies right away so they don't go fuzzy. Fuzzy cookies aren't good for Shar Peis apparently. There they are! My favoritest cookies! Honey Bones! Drool. Miss Lea also sent me some special cookies to taste test. I haven't had any yet, Mom is saving that for the weekend so I'll have a lot to blog about on my Monday Morning Report! Miss Lea also sent me these things. I know that's a pig tail, is that a Bully stick though? Mom and Dad say that my digestive system can't handle those so I won't be able to write a report for Miss Lea. I'll make sure they go to another doggy who will appriciate them. Then I'll think about having a guest blogger to review them. Sigh. That was a lot of excitement to relive. I'm going to go nap and dream of getting more Honey Bones. Thankful Thursday - And a Song! Moose made me laugh yesterday in his comments. He said it looked like a nice day to go out and Pei! Everyday is a nice day to go out and Pei Moose! Pei laughter. Even though yesterday was raining and I didn't want to go outside. Rain makes you wet you know. Thanks for the laugh though Moose! You're pawesome! So a lot of people commented on the colour of the door and how nice I looked against it. Red and black are a good combination. Mom wears it alot. Although yesterday Mom and Dad and I were all wearing purple and black. We didn't even plan it. We're so in tune with each other. It's by Crosby Stills Nash and Young. 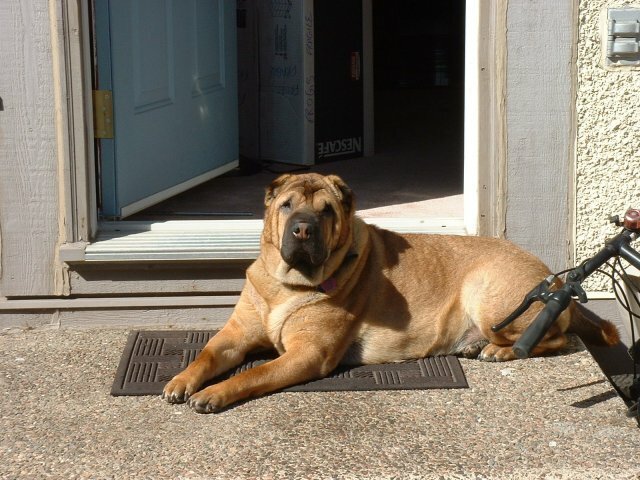 So, here's our house, with the Shar Pei in the yard. Just to let you know, the door wasn't always red. Mom and Dad had to have it painted a few years ago. Something about rules or something. That's my predecessor Shih Kwan. He looks nice against the blue door. That's the weekend Mom and Dad moved into the house Mom says. And that's me last week in the front garden making sure the frogs are ok. Tune in tomorrow when I'm sure something exciting will happen. Or maybe Mom will sing again. Who knows. Another busy day for me yesterday. I did get almost a full day in of napping, so that was awesome! I'm re-energized. Then Dad came home and I had to snoopervise the collecting of the garbage and making sure he ate supper yada yada yada. I was very lucky that when we went out to drop off the garbage bags, Mom was on her way up the walk! She got kisses and happy noises and then Dad was off to do whatever Dad does when he's not around me - which can't be all that fun honestly, if I'm not there right? Mom was feeling a little teary for some reason so I made sure to stay close and on the lookout. I have to protect her you know. Anyone out here dissing my Mom? You'd better not be. I made sure she got lots of cuddles and she feels much better this morning. A Shar Peis work is never done. I wish she'd go back to bed though, I need to catch a few more naps to take care of her properly. What a busy weekend -I- had! Phew! Saturday I snoopervised Dad as he finished cleaning up the newly painted room, then, when Mom came home, we HAD to go ADVENTURING. Which, of course, means that I worked on my excited happy Adventure drooly face. I was exhaustipeited when I came home and I still needed to snoopervise the moving of Daddy's computer desk into the new computer room. Oh my dog! Mom and Dad said I did such a good job snoopervising that they gave me a squirrel. I barely had enough energy left in my to squeak it I tell yeah. Sunday I sent THEM both off to work so that I could catch up on my naps. I really needed to recoup some energy you know. Then Mom came home and I had to snoopervise her desk cleaning. Then it was off to rescue Daddy! and back here to snoopervise the moving of more furniture, including Mommy's computer desk and the setting up of the internet connection. I was pooped out again! I was hoping for some normalcy this morning but I didn't get it. Mom and I walked Dad and his bike to the end of the path so he could bike into work. It was a nice walk with my parents, but I think I'll send Mom off to work and take a richly deserved nap. Who knows what's going to happen tonight. I don't want to go through snoopervisory burnout you know. I hope I picked up enough sunshine for everyone yesterday. Doesn't it look like I did? Mom says she thinks I'm solar powered. It could explain why I'm kind of blackish. All my fur is solar collectors! Pei laughter. I was so proud of Mom last night. I've been teaching her pretty well. SHE stole Dad's blanket during the night! Pei laughter. I'm so proud of her! I'll probably be snoopervising everything again this weekend. What's everyone else up to? As promised, here is a picture of me doing something Cute and WONDERFUL! Mom had the camera on the wrong setting or it would have been better. She did play with me though. She's good at throwing my stuffed tree. Yesterday morning was kinda blah here, but it was sunny in the afternoon! Can you see me doing this a lot? Yeah. And meditating in the sunbeams. Mmmm. Well, it's sunny here today so I hope I can find a sunbeam to meditate in. Here I was all set to do a Wordless/Whispering Wednesday and then Dad finished painting the spare room last night - I was snoopervising so I have to report on it, and then this morning, Mom and Dad were all smoochy face and it turns out it's their WEDDING ANNIVERSARY. Nobody tells me ANYTHING. So I made sure to cuddle both of them and I hope that'll make up for not getting them a card. So here's the before shot of the room. That's during. And then there's AFTER: It looks SO COOL now. Dad did a great job. You can see him working hard there. I, or course, snoopervised everything, because that's what Shar Pei's do. I hope everyone has a great day. Come back tomorrow when there will be a picture of ME doing something cute and wonderful. It's a little sunny here! I have been spending some time in my backyard, sniffing everything and surveying my domain. That's me surveying my domain up there. Yuppers. I'm pretty good at surveying. I had an Adventure yesterday to go and visit the cow that lives in the farm behind our house. Where was Mom's camera? Not around her neck I can tell you that. I think I need a new photographer. Grandad? Are you availble? Oh and I can't forget to tell you about the email I got last night! 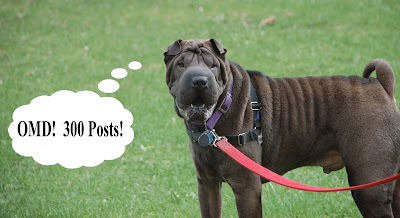 It's from Ms Lea at Poochini's Barkery! I had sent her a lovely email ordering some cookies. She sent me back an email saying they're being shipped today. TODAY! I'm so excited! I'd better check the mailbox! Maybe they're here already! I don't know about anyone else, but I've been working hard this weekend. I had to snoopervise Daddy on Saturday - he was painting. I would have snoopervised him up close and personal but I had to stay outside the room he was painting. 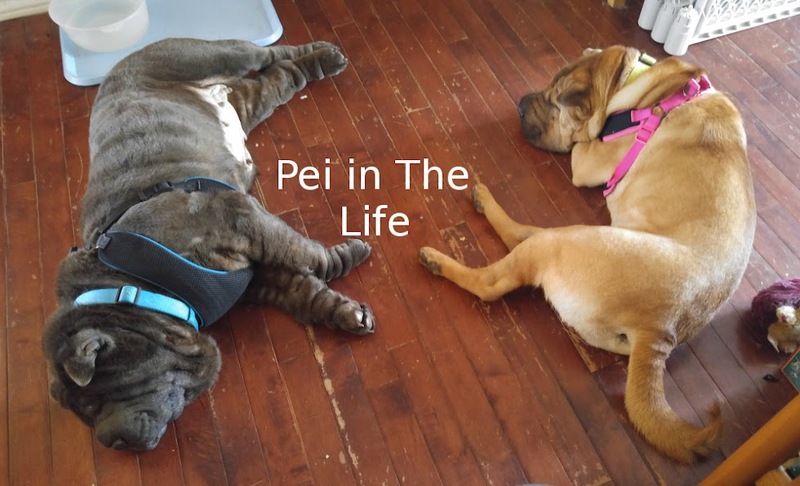 I don't know if green would be a good colour for a pei. On Sunday, I had to snoopervise Mom's nap AS WELL AS Daddy adding more green stuff to the walls. Like WOAH! Good thing I'm an experienced snoopervisor. That's my You are going to open the door aren't you? look. What'd you think? Uhhhhh, Mom is making me write WAY too early because she has to get out early which means I need my Adventure early....I'm lost and confused, can I go back to bed? Sigh. OK, It's Frootbat Friday at Tom, Tama-chan and Sei-chan's place and I've been hanging on to this picture for a while. How'd I do in the Frootbat department? Can I go back to bed now? Oh, and Dad, thanks for moving the big TV and the PlayStation into the bedroom last night. Could you leave a few games and movies, for when I really wake up. Thanks. So if you follow my blog, you know I spent yesterday at Day Care! They were so happy to see me. They miss me so much when I'm not there. I even had ICE CREAM. Oh it was good. Mommy came to get me after a very busy day and we walked home together. We got home and Daddy wasn't there. This concerned me until Mommy mentioned that my Fan Club - remember my Fan Club from last summer? Yes, that's them. They borrowed my Daddy and his swords and armour for a a Fundraising Fun Fair they were having at their school. How come they didn't ask for me? Anyway, Mom and I were just relaxing after supper when she got up from the bed and answered the phone. It was my Fan Club's Dad and they were bringing MY Daddy Home! So we ran outside to meet them! They all poured our of their car and said Hi Bolo! and I got cuddles and scratches and lovin'. Daddy was home in one piece, that was good too. They had to leave when My Dad noticed that Mom and I were getting eaten by buggies. They all ran back into the car and waved at me, so I waved back and went inside to cuddle my Dad. Ahhhh. I have to catch up on my naps today, I was a little busy yesterday snoopervising the Day Care people. It's kind of grey and yucky outside so that'll work out well. Those make great napping days. But first I'll send nose kisses to my Fan Club! Thank you for taking such good care of my Dad! And thank you for bringing him home. Pei Ess, Moose gave me award this past week. Someone remind me to talk about that later. There's no picture today because Mom needs to take more. I feel like we've recycled all my other ones too many times. I'm going to whine at her until she takes the camera and I outside. Yeah, that'll learn her. Mom and Dad were up early this morning and I was a little worried that I wouldn't get my morning Adventure, I don't always get it if Daddy takes the car. They didn't let me down though! Mom and I walked over to Subway to meet Dad. I got to stick my nose int he door and take a sniff! Mmmmm. Then Miss Cheryl, who makes Daddy's sub, came over to love me! OH WOW! That's a fun Adventure. Daddy drove us back home and now I'm protesting the lack of pictures. So, how is your Tuesday going? Welcome to the Monday Morning Report! It's been a busy weekend. I had to snoopervise Dad in taking wallpaper boarder off the wall. It's a tough job but somepuppy has to do it, right? Sniffing the air is also VERY important. That's how you discover what's going on in your neighbourhood. Then yesterday was Mother's Day. I maybe got in a little bit of trouble there. I was cuddled up to Daddy last night and he kept saying cuddle Mommy, she needs Bolo cuddles. But cuddling up to Daddy was what I wanted to do! I may have gotten Mommy upset. I did stay curled up to her all night and part of this morning. Does that count? Hmmm. I'm going to have to think about how to make it up to her. I did give her nose kisses this morning and I don't usually. That might not be enough though. I'd better go think on that. 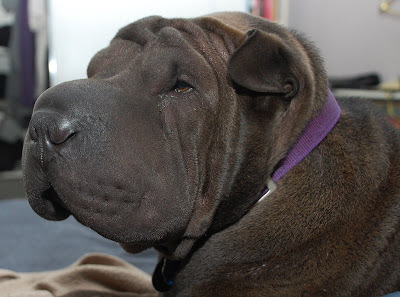 I thought I'd post my Happiest Shar Pei picture for Happy Friday. Mom and Dad LOVE this picture. I have to admit, I think it's pretty great too. I had an amazing time at Day Care yesterday with OODLES of lovin' from all my girlfriends there. But it was nice to go home with Mom and Dad. I had missed them. I remembered to bring back Mom's laptop too so maybe she'll send me with it again! Thank you to everyone who stopped by to visit my blog yesterday and to wish me a Happy Blogoversary. I guess that's all I had to say. Oh, except we had a middle of the night/very early morning Bolo Cuddle Sandwhich going. Life's rough isn't it? I hope everyone has a nice weekend and remember it's Mother's Day on Sunday here in North America. So make sure all your Mom's get Nose Kisses and Cuddles on that day. Well, every day actually. It's my blogoversary! I'm posting this picture so you can see my excited face. I'm on an ADVENTURE! I'll give you a few hints as to where I am. Mom called to tell them I wanted to come play today. Then this morning she packed my LUNCH BOX! Can you guess? Yup! I'm at DAY CARE! WOHOO! Not only that. Mommy sent her laptop with me so I can write to you and surf during my down times! She's the bestest. I'd like to point out that I braved THE RAIN to come to Day Care. I hate the rain. But it was my ADVENTURE so it was worth it today to go walking in the rain. I want to thank everyone who gave Mom better ideas than a nail clipping to celebrate my blogoversary! (Whisper) Tomorrow is my 1st Blogoversary! that and my 300th post yesterday made Mom want to celebrate with me so she took me to get my nails cut. Uh hunh. Not my idea of a celebration. Maybe give her a few ideas for tomorrow every puppy and kitty. PLEASE? I don't want my nails cut again. I WAS going to write a post saying how NOTHING exciting is happening today but just as I started typing Mom said, check how many posts you've done. So I did. Mommy has promised me an Adventure today, and I do believe her that I will get one, but Daddy took the car so I couldn't drive him to work. Sigh. I hope he has a good day anyway. Of course, he'd have a better day if I was with him. No question about that. I should go celebrate my 300th post! I'm sure there's a squirrel to chase SOMEWHERE. Welcoem to my Monday Morning Report. Well, I had a great weekend. On Saturday, I once again snoopervised Daddy in everything he did. And I napped. What would have been REALLY cool was to snoopervise Daddy while we were napping together. I'll suggest it for next Saturday. On Sunday, I napped, then huggled Mom and Dad as much as possible, then I went for an ADVENTURE walk! WOhoo! Here's an example of what I do on an Adventure walk. This is me barking at a squirrel. Everything was going well until after my walk. Mom and Dad - I hate to say this, I don't want to frighten everyone - they gave me a B-A-T-H. I won't horrify you all with pictures, there are young pups and kittens out there, I wouldn't want to traumatize them. Suffice it to say I'm ok now and I expressed my displeasure by curling up my damp wrinkleyness on top of Daddy's piilow before he came to bed. That'll learn him. Looks like today is going to be a nice day. I think I'll practice my napping, and chewing on rollover bones; and looking out my window. Souds like an exciting day. It wasn't raining much when Mom and I took Dad to work, but it was wet out and there were little droplets on the car and big puddles to walk through. Mom and I had our walk while Dad went and got his coffee. I got to sniff the lady at the grocery store's garden centre! She smelled REALLY GOOD. Sigh. What a nice lady. She said I was very cute. When we came home I had to stop and say hi to our neighbour and her cat. The neighbour came out to pet me but her cat would not, no matter how much I barked and wagged to encourage her. Some puppies eh? Now I'm inside so it can rain all it wants, because I'll be dry and toasty and napping on what Daddy thinks is his side of the bed. Even Mom thinks it's his side of the bed. How they can be so wrong I'll never know.